English 19th-century red morocco by Zaehnsdorf, lettered Heures de Rouen Ms. sur velin - vers 1465; in olive morocco case with same lettering. Arms of husband and wife named Jacques and Antoinette, in borders (gules a griffin or within a bordure azure with besants; argent a chevron sable accompanied by an estoile of six points gules); owned (18th century) by John Maule; later by Mr. Baron Maule; bought (Dec. 2, 1896) by Richard Bennett; purchased by J. Pierpont Morgan (1837-1913) with the Bennett Collection in 1902; J.P. Morgan (1867-1943). 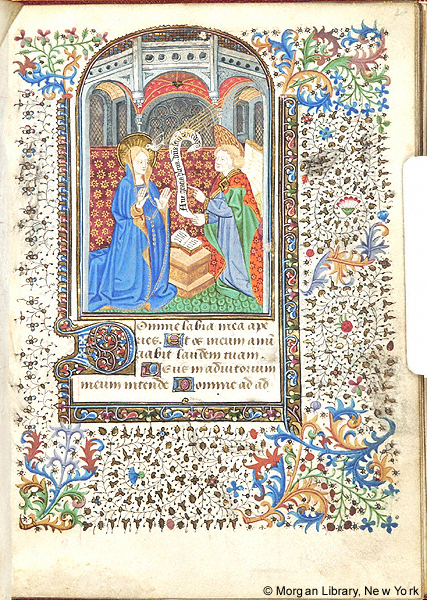 Ms. book of hours for the use of Rouen; calendar in Latin, mainly Rouen; written and illuminated in Rouen, France, ca. 1440-1449; calendar and first three miniatures added ca. 1490. Decoration: 12 miniatures from first campaign of illumination (ca. 1440-1449), 2 miniatures and 24 calendar illustrationsfrom second campaign of illumination (ca. 1490); owner portrait pictured with patron saint St. James on fol. 13r; his unidentified arms below; wife with patron saint St. Anthony and her arms on fol. 14r; names of owners thus thought to be Jacques and Antoinette. Artist responsible for the first campaign of illumination (ca. 1440-1449): a follower of the Talbot Master. Artist responsible for the second campaign of illumination (ca. 1490): a Rouennais artist.